In addition to the Implementing Rules, non-binding Technical Guidance documents describe detailed implementation aspects and relations with existing standards, technologies, and practices. 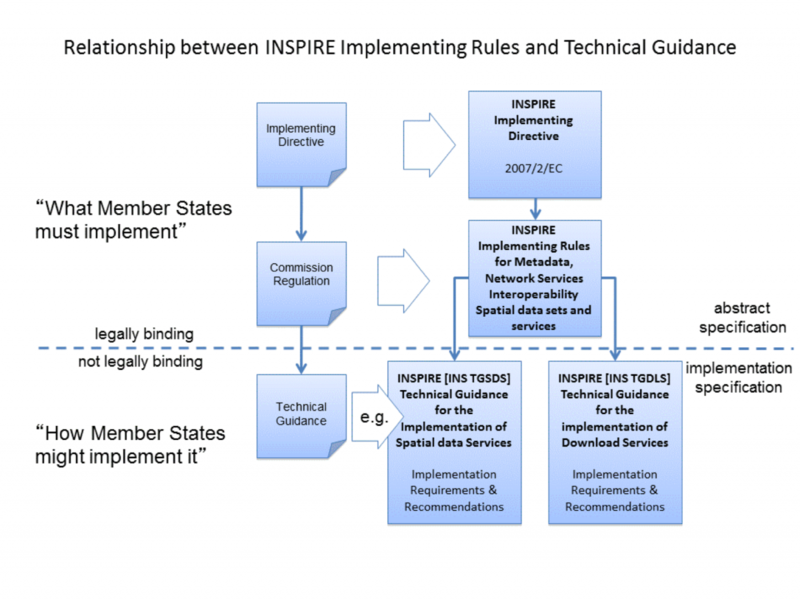 The figure below illustrates the relationship between the INSPIRE Regulations containing Implementing Rules and their corresponding Technical Guidance documents. Technical Guidance documents define how Member States might implement the Implementing Rules described in a Commission Regulation. Technical Guidance documents may include non-binding technical requirements that must be satisfied if a Member State chooses to conform to the Technical Guidance. Implementing this technical guidance will maximise the interoperability of INSPIRE services. The maintenance of the Technical Guidance documents is an important task of the INSPIRE maintenance and implementation framework. See all Technical Guidance documents here.